A few weeks ago I picked up a 2nd-hand copy of Teach Yourself Russian for 50p in a charity shop, but I haven’t even been able to wrap my head around the alphabet yet! In an effort to keep my motivation up, I thought it might help to check out some Russian culture… but all I could find was the four hour-long ITV adaptation of Doctor Zhivago (2002). Ironically, the majority of the main cast members speak with English accents, and the only “foreign” language you ever hear them use is French! 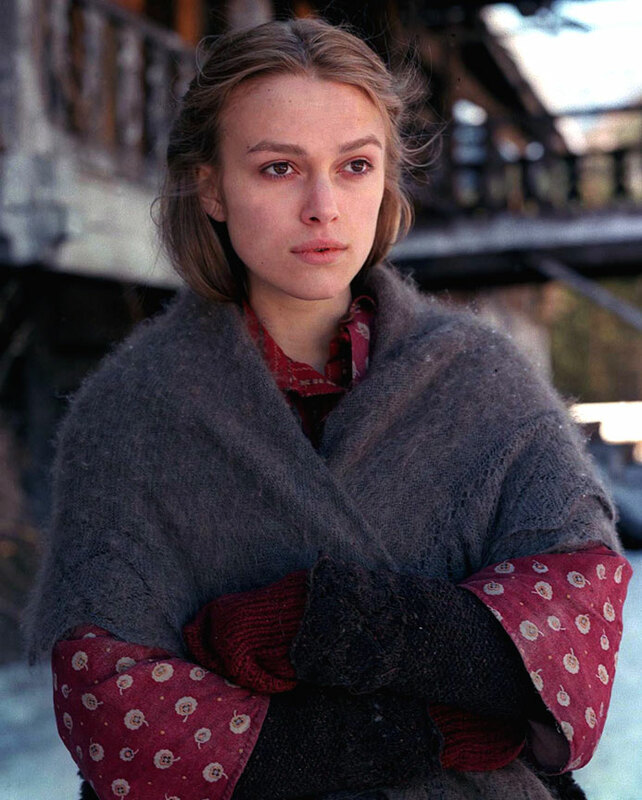 For those who don’t know, this “epic tale of love, betrayal and loss” is set against the backdrop of the Russian Revolution, and stars Keira Knightley as ‘Larissa Guishar’ (aka “Lara”), a young Muscovite girl whose beauty and charm bewitches three very different men: Suitor No. 1, ‘Victor Komarovsky’ (Sam Neill), is a callous, calculating businessman with political pull, who casually transfers his affections from Lara’s mother (Maryam d’Abo), to the nubile daughter. Suitor No. 2, ‘Pasha Antipov’ (Kris Marshall), is an idealistic student who worships Lara, but is equally passionate about his politics, and the future of his motherland. Suitor No. 3, ‘Yuri Zhivago’ (Hans Matheson), is a conscientious medical student who first falls for Lara when he spots her through a cafe window one day, while noshing with his platonic childhood friend, ‘Tonya Gromeko’ (Alexandra Maria Lara). The story then follows these characters through various couplings and crises, across several decades, as they bear witness to an especially tumultuous and treacherous period in Russian history. I haven’t read the celebrated novel that this show was based on, and I haven’t seen any of the previous (or subsequent) adaptations either… so I can only judge it in isolation, as an artefact unto itself. As you might expect, The Curse of Compression is evident here, and it isn’t helped by the fact that the cast look pretty much the same age at the end of the story as they did at the start. I mean, sure, beards come and go, and there’s a little more grey in the men’s hair in the final hours, but Knightley remains an eternally fresh-faced teenager, even when she’s supposed to be old enough to have raised two children of her own! This isn’t just petty nitpicking on my part, because it really undermines the epic scale of the story, and throws off your sense of how long the characters have spent together, or spent apart… so it’s much harder to care about their (many, many) separations and reunions. The effect is especially apparent when someone has to act as if they don’t quite recognise another character, even though they look exactly the same as when they last saw them, five minutes ago. Meanwhile, I know that the cast members are all very talented actors, whose work I’ve enjoyed in many previous projects, but here they often deliver their dialogue as if stiffly overdubbing a foreign language film in English. It’s very off-putting. Speaking of the cast, I should also mention that Celia Imrie has a small cameo as Tonya’s ailing mother, ‘Anna Gromeko’… and Anne-Marie Duff has a recurring role as Lara’s (equally immortal) friend, ‘Olya Demina’. Overall I quite enjoyed the experience, but couldn’t help thinking that it’s probably a story that works a lot better on the page than it does on the TV screen. This entry was posted in Rants about TV and tagged Alexandra Maria Lara, Anne-Marie Duff, Celia Imrie, Doctor Zhivago, Keira Knightley, Maryam d'Abo. Bookmark the permalink. 1 Response to Вы Говорите По-Русски?